I have to say that I’m very grateful for having won this novel in a giveaway, especially since I never win anything. And to add to my excitement I won it not once but twice (from two different sources). 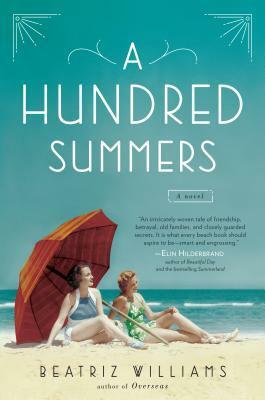 So, I shall thank both Literary New England radio and Chick Lit Central blog for my two copies of A Hundred Summers, one of which I happily shared with a friend. As the New England hurricane of 1938 slowly marched ahead through the pages of A Hundred Summers, the novel has slowly swept me away within its eerily grandeur setting of an oceanfront community, its residents, and their complex and intricate histories. Lily Dane and Budgie Byrne have known each other since childhood as their respective families had summered at the same oceanfront community at Seaview, RI every year. But the two women cannot be more different, yet they are friends, or so it seems at first glance. Budgie has always been the life of the party, the femme fatale, if you will. While quiet, attentive Lily was quite content in Budgie’s shadow. But when the two women visit Budgie’s boyfriend – Graham Pendleton at his college’s football game, Lily meets Nick Greenwald and the two, fall in love quite suddenly. Fast forward to 1938, Lily has once again returned to Seaview, joined by her never-present mother, her matter-of-fact and acerbic aunt Julie, and a very keen younger sister Kiki, whose parentage raises a few questions. But the placid summer pace is soon disturb, when Nick and Budgie Greenwald walk back into her life. As the summer unfolds, it is undeniable that Lily in Nick still harbor feelings for each other. And while Lily, being her sweet self, tries to salvage the pieces of her and Budgie’s friendship, she slowly begins to uncover the many secrets enveloping them all. “As I turned down Neck Road, I lifted my eyes and caught a glimpse of the ocean, thick and gray, streaked with long rollers beneath a sickly dun sky. A gust of wind caught the car, making it stagger. Alternating between the events of the early 1930(s) and the summer of 1938, Ms. Williams weaves a beautiful story. And as pieces of the puzzle slowly begin to fall together so do Lily Dane and Nick Greenwald. Love, lies, betrayal and cover-up, A Hundred Summers has it all and more.